His war has been won. The few humans left alive are enslaved, the mutant rebellion crushed. 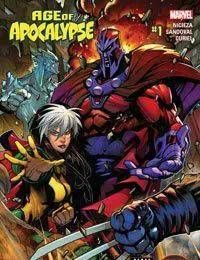 EN SABAH NUR, the APOCALYPSE, rules his BATTLEWORLD kingdom without mercy, but the terrorist X-MEN plan to end his reign. Success means finding one very special mutant named CYPHER and unleashing a weapon that will kill Apocalypse -- and possibly all mutants, too! Merv Pumpkinhead, Agent of D.R.E.A.M.